Simona Halep is the world's top-ranked player, but there's one thing missing from her resume: a Grand Slam title. The four Slams have always represented the tentpoles of tennis, a quartet of tournaments that jut out and jut up, rising above the other events on the calendar and anchoring the sport. But more so than ever, players make their reputations—and income—at the Australian Open, French Open, Wimbledon and U.S. Open. 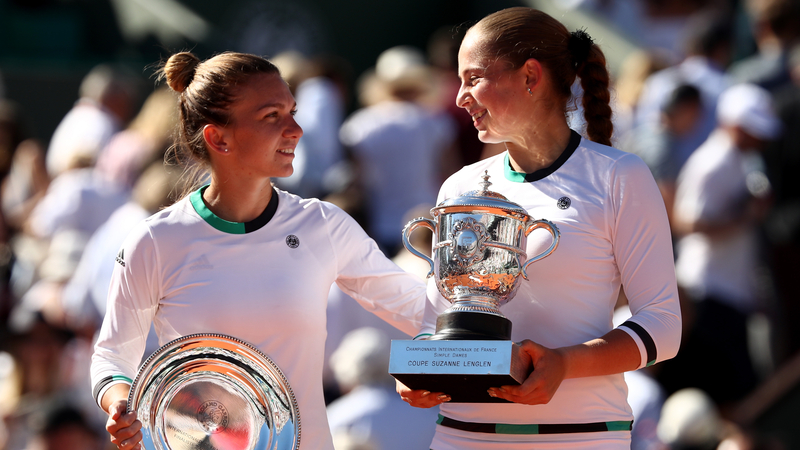 The dozens of other tennis tournaments interspersed throughout the year can feel like pleasant, small-budget rom-coms that simply pad the studio’s schedule before the four annual blockbuster releases. This works to the advantage of some players. Solely by dint of his tally of singles titles at the majors—a record 20 and counting—the ageless Roger Federer has cemented himself as tennis’ GOAT. Likewise, if you’re making the Greatest of All Time case for Serena Williams, as we do, you’re first exhibit of evidence is the 23 Slams she’s won, more than Steffi Graf (22), Martina Navratilova (18) and Chris Evert (18). This weighting system, though, works to the detriment of other players. Take Simona Halep of Romania, for instance, an exquisite player who moves with grace, strategizes with wit and hits with an aggression that belies her modest physique. She’s currently the world’s top-ranked player, a position she’s held for 14 weeks, and has won 16 titles in her career. But there is a conspicuously missing element in her list of qualifications: she has never won a major. She’ll get her next chance at the French Open, which starts Sunday in Paris. Halep will enter as the top seed and—with Serena still shaking off the rust from her maternity leave—a slight favorite. If she can fulfill her seeding and win seven matches, Halep will finally get her tennis certification. Editor’s note: The following interview was lightly edited for clarity. Jon Wertheim: Some top players that have never won a major have denied the issue, almost rejecting the topic. Others have taken the challenge head-on. You’re in the second group. Simona Halep: Yeah, I'm happy to talk about that because it is the only one thing that, until now, I haven’t won. I'm thinking that I'm there, that I can do it because I was so close three times. Just needs time maybe, patience, and belief that I can do it. JW. What do you do to build self-belief? SH: It’s really true what every tennis player says: winning matches builds confidence. JW: Okay, but it’s like chicken-and-egg. How do you build the confidence to win those matches? SH: By practicing right and working hard and trying to be a professional. Even before you play the first point, you go on the court feeling confident because you know you have been doing everything the right way. SH: Yes. It’s been a lot of discussion about balance. I try to find perfection, and it can be frustrating when I don’t achieve it, even though, of course, perfection is impossible. The goal is to keep trying for perfection but to be kinder with myself when it doesn’t happen. JW. What do you think is the biggest sacrifice in your life that you've had to make to be No. 1? SH: I think my [breast reduction] surgery in 2009. When I did it, I did it for tennis. Maybe doing that was really important to today be No. 1. JW: That's the biggest sacrifice? SH: Yeah. But you know, I don't feel that I made sacrifices by being here or playing tennis because I really like this sport, and it’s never tough to go and practice. JW: I recently saw you described as a “spiritual underdog,” even though you are No. 1 in the world. Is this how you see yourself? SH: Do you think I’m an underdog? JW: Maybe because you’re not the biggest player, maybe because you don’t win the easy points on your serve. But never mind me. Do YOU think you’re an underdog? SH: Yeah, maybe, because I'm not that tall. But I also feel that I have a good game to play fast and aggressive as much as possible. And also my defense is really good. I can run a lot. SH: I'm pretty realistic. I cannot wish to be Chris Evert or Martina Navratilova because they won, like, a hundred Grand Slams. JW: But is there a specific player that pushes you? SH: Not really. I'm just trying to focus on myself, how to get better day-by-day. I can honestly say that every time I go on court, I see the opponent in a competitive way, but not a rival. JW: When you take inventory of your career, what are you most proud of? SH: That I never gave up after tough losses. But one moment? In Rome, I think Rome, I played quallies one year and beat [Aga] Radwanska in the second round. I was always following her, seeing how smart she is on court, how she's playing. Very intelligent player. I never thought I could beat her. That was a big win for me and it was important because it was the moment I thought, I can do this. JW: What’s been the happiest moment of your career? SH: My Grand Slam final, in 2014. For sure, that was the biggest moment. JW: After that match, how did you feel? SH: I was not that sad because I knew [Maria] Sharapova is a great player and a great champion. I won't say that I didn't have belief, but I won't say that I knew that I'm going to win. So it was in the middle, and the balance was really good. I just was happy about the final. I didn't upset myself. SH: Last year was different. JW. What is your relationship with the French Open? SH: Like people say, no hard feelings. I won juniors there. It’s close to my home country. I love Paris, just to stay there and visit. Maybe I’ll live there one day. So I just love everything about this tournament. JW: What is the biggest extravagance, the nicest thing you've treated yourself to? SH: I give myself little presents all the time. But I don't do extravagant things. JW: You didn't treat yourself to something after Australia? SH: No. Actually no, I didn't. I tell you, I was very sad. I lost the final, so I didn't. JW: Your agent is Ion Tiriac, former player, a manager, a billionaire, something of an international man of mystery in tennis. JW. When people say, ‘What is Mr. Tiriac like?’ What do you tell them? SH: He's really professional. He's very hard. He knows everything about this sport because he's been around for many years. I think he was the best manager in those years with [Guillermo] Vilas and Boris Becker. He's by my side all the time. JW: Does he make you laugh? Does he tell stories? SH: Many stories about when he was playing, and also when he was coaching, managing. So I have many stories from him. Yeah, he makes me laugh every time. JW: Has he ever eaten a glass for you? SH: I heard he’s done that, but with me, no. Maybe I can bet if I win a Grand Slam, he eats glass. I'm sure he does. JW: If you win a Grand Slam, he eats a wine glass. SH: Yeah, I will tell him.